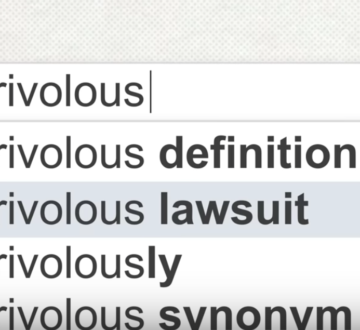 When someone talks about frivolous lawsuits, they’re referring to civil cases, not criminal cases dealing with things like assault or robbery. Civil lawsuits decide disputes between people or people in a corporation, usually to hold someone accountable when they cause harm. But civil lawsuits have actually been on the decline for decades. Back in 1993, 10 out of a thousand Americans filed civil lawsuits. In 2015, fewer than two and a thousand. And yet drug oil and insurance companies have spent millions to generate myths about how lawsuits are out of control. Lawsuits over texting during a movie, a strong handshake, or jelly beans, it’s a crazy world out there. Ok, but why should you care? Because the civil justice system exists to give everyone a fair chance and it’s had major positive impacts on important issues that affect each and every one of us. To name just a few, since 1974 the Consumer Product Safety Commission has issued recalls on more than 850 toy products due to dangers like choking hazards, magnets, and LED. Parents depend on the civil justice system to ensure their children’s toys are safe. In the 1960s, civil lawsuits revealed that GM knew the placement of some of their gas tanks could cause fires and explosions in accidents. They could have fixed them for eight dollars and 40 cents per car but calculated the paying for 500 fatal accidents would only cost two dollars and 40 cents per car. The civil justice system held them accountable and resulted in requirements for fuel tank performance and rear-end collisions. And it continues to help improve auto safety across the board. Remember the Exxon Valdez oil spill in 1989, the disaster spilled more than 10 million gallons or over 1,000 miles of remote coastline. Trial attorneys worked for 20 years in court to hold Exxon accountable as the corporation did everything it could to avoid liability. Exxon was eventually forced to clean up their mess. Civil lawsuits like these help all of us keep our community safe and there’s nothing frivolous about that.